Kosher fare in Los Angeles that is out of this world. 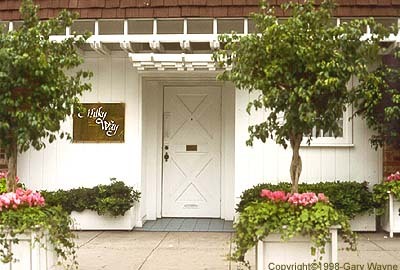 As I was in Los Angeles for business, I made a point to visit The Milky Way, an upscale kosher dairy restaurant nestled in the heart of Jewish Los Angeles on Pico Boulevard, amongst the kosher meat markets, delicatessens, Jewish bookstores, Jewish grocers and local synagogues. 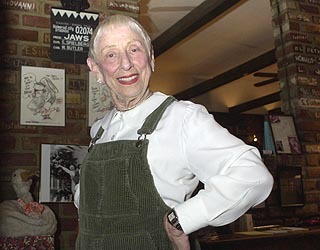 The restaurant now celebrating its 30th anniversary was the brain-child of Leah Adler, better known as "Stephen Spielberg's Mom." Leah still greets everyone at their table and makes them feel at home in her restaurant. Originally from Cincinnati, Ohio, Leah grew up ("ages ago" she says) in our area, just across the Delaware River in Haddonfield, New Jersey. Leah Adlerr and Steven Spielberg featured on the cover of Mothers and Sons: In Their Own Words by Mariana Cook . The restaurant's decor features the affiches from all of her son's feature films, from Jurassic Park to Schindler's List. There are also photos of Leah with her son and other famous people who have frequented the Milky Way, including Bill and Hillary Clinton. The table settings and refined menu bespeak an upscale kosher dining experience. I took Leah's recommendation and tried the "Clam Chowder" made with Haddock in the place of bonafide clams. Leah grew up "100% treif" and developed a taste for clam chowder, so upon becoming kosher she created this variant for her restaurant, claiming that it is as good as the real thing. I cannot vouch for its resemblance to real clams, but I can say that I was not disappointed: this was a hearty yet refined fish soup, really a meal unto itself, even though I took the waitress's advice and only ordered what she called a "small bowl." The restaurant's signature dish is its selection of Cheese Blintzes. This is a family recipe which Leah's mother prepared based on the old Settlement Cookbook. I enjoyed the Spinach Crepes which are a tasty combination of creamed spinach accented by fried onions and wrapped in two golden crepes. The crepes are topped with melted cheese and served with garlic bread. So the next time you are in LA-LA-land, make a point to visit Leah Adler and her Milky Way. You will not be disappointed. Leah Adler at her restuarant "The Milky Way". Combine all ingredients and mix well. Pour batter (about 3 tablespoons at a time) onto a hot, slightly greased pan, and rotate pan so that mixture covers bottom completely. Fry on one side only. Combine potato, egg, and seasonings. Brown onion in butter. Add to potatoes and mix well. New England "Clam" Chowder Leah said the chef's secret to the flavor of the delicious fish chowder served at The Milky Way — reminiscent of the clam chowder Leah loved before her kosher days began — is to use lots and lots of white pepper. Sauté onions and celery in butter until soft, but not brown. Add potatoes, seasonings and water, and simmer until potatoes are tender. Cut fish in small pieces and add to soup. Cook another 10 minutes. Do not stir. Add milk and reheat. Do not boil. This is a meal in itself. 8 to 12 servings. Food Editor's note: Since the recipes for dishes prepared at The Milky Way are all written with restaurant quantities, not easily adapted for the home cook, Leah Adler gave us license to provide recipes for her best-sellers from other sources. All of the recipes in this month's column are from Second Helpings Please!, a wonderful traditional kosher cookbook edited by Toronto food maven Norene Gilletz and first published in 1968 by the Jewish Women International of Canada. Lisa will feature Noreen and her newest cookbook, Noreen's Healthy Kitchen, in an upcoming issue of The Kosher Table.